Christmas lost her previous calf Easter in 2016 so we are all very excited that she has had another calf, appropriately named ‘Spirit’. In January we also welcomed ‘DC’ who is the calf of ‘Dylan’, one of the Dawesville cut dolphins. DC (named after Doug Coughran, a long serving wildlife officer who has attended many dolphin strandings and entanglements in Mandurah) is already showing its cheeky nature venturing off from mums side. 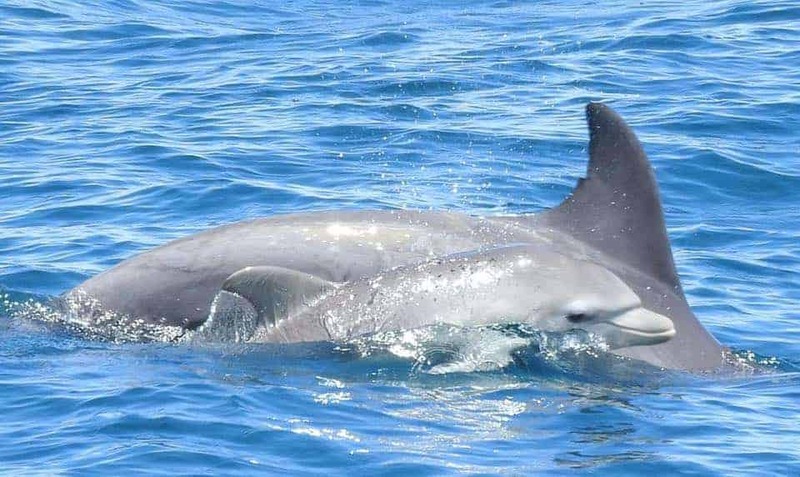 The most recent addition to the Mandurah dolphin community is ‘Sooty’, only a few days old. ‘Coal’ is the mum, who has previously had other calves including ‘Ash’. They have been spotted in town several times already this week. There are three newborn calves so far in the coastal community. ‘Duke’, ‘Malibu’ and ‘Blue’ have all been seen recently with calves on our Dolphin Island Adventure. When a calf is first born they weigh aproximately 20kg and are around 1m in length. They have several vertical, light-coloured folds on their sides which is a result of foetal folding – from being in their mother’s womb. These folds turn into lines and usually disappear within six months. When a calf is first born it has whiskers on the upper jaw (rostrum) which fall out soon after birth. Their dorsal fin and tail flukes are like a piece of jelly flopping around – they lack firmness for the first few days but gradually stiffen. Newborn calves swim close to their mother and are carried in the mother’s “slip stream” – the hydrodynamic wake that develops as the mother swims. This helps the baby to swim and enables the mother and calf to stay up with the group. As the calf gets older it swims in what is called baby position, just behind and to one side of their mum. This allows easy access to the mammary slits for feeding. Females dolphins in Mandurah generally have a calf every 3 years. The calf will then stay by its mothers side for up to 3 years and suckle her milk for the first 18 months. In 2017 we had 5 new calves in our inland waterways – Splash, Sea, Speckle, Nikaila and Andrew, on top of 10 new calves in 2016. This is a great start to the year with so many newborns to the Mandurah dolphin population. If you are out on the water please remember to slow down for dolphins and give them space. Next Next post: Topnotch is a mum again!